If you like red velvet, you’re going to LOVE these light and fluffy red velvet cupcakes! Topped with luscious cream cheese frosting, they’re so delicious! Finally, an easy red velvet cupcakes recipe that’s made in just one bowl! Easy to bake and easy to clean up! and perfect for Valentine’s day, Christmas, and birthday celebrations! Red velvet is one of the most requested cupcake flavors in the world! So today I’m excited to share my foolproof recipe with you! Because I want your cupcakes to come out perfect, I’ve included a ton of helpful baking information below. I know it probably looks like an overwhelming amount of reading (I do tend to dork out about baking) but I promise it’ll only take a few minutes. And the lessons you learn will make all of the difference in your baking adventure. If you’re new to baking, I definitely suggest reading everything over before you begin. And if you have additional question, drop me a line in the comments and I’ll get back to you asap! 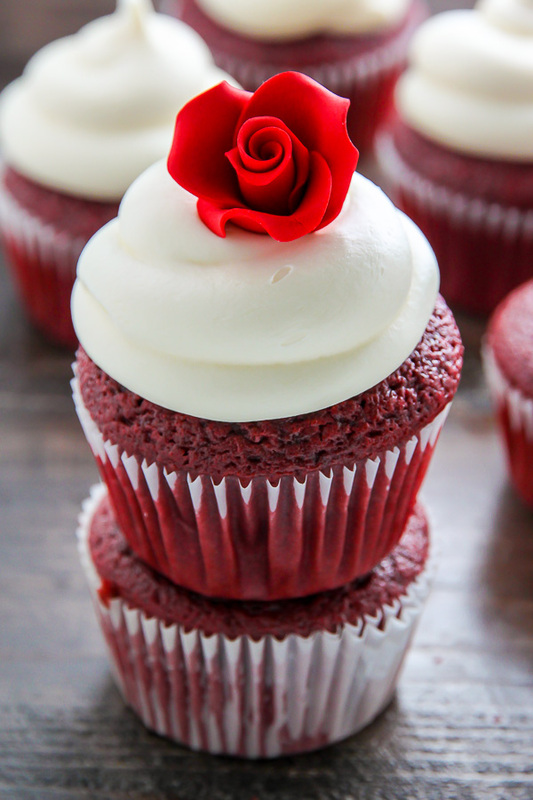 So…what does a red velvet cupcake actually taste like?! This is a question I get all the time! But I get it. Because up until a few years ago, it’s a question I had, too. It’s hard to imagine what something so red will taste like! Here are the most frequent questions I get: Are they chocolate cupcakes with red food coloring? Vanilla cupcakes with a little cocoa powder and red food coloring? Do they just taste like food coloring? No, no, and – thankfully – no! 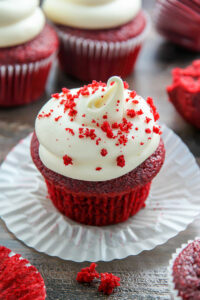 When made correctly, a red velvet cupcake should be extremely moist with a tender and fluffy crumb. In terms of flavor, the cupcakes are super rich, buttery, and sweet, with a slight tanginess from the buttermilk. The chocolate flavor is very subtle, and compliments the sugar and buttermilk used in the recipe. If I had to choose a classic cupcake to compare red velvet to, it would be yellow cupcakes, because they share a rich, buttery flavor. But really, red velvet is in a class of its own. After one bite, you’ll know – er, taste – what I mean. For the dry ingredients you’ll need flour, cocoa powder, cornstarch, baking powder, baking soda, and salt. We use the combination of flour and cornstarch instead of cake flour. This combination ensures a moist and delicate crumb. For the wet ingredients you’ll need butter, oil, apple cider vinegar, eggs, sour cream, and buttermilk! Buttermilk is absolutely essential when it comes to baking red velvet cupcakes. It adds a trademark tangy flavor to the cupcakes. It also makes them moist and fluffy. So you really don’t want to skip it! In addition to the previously mentioned buttermilk benefits, this powerhouse ingredient also helps to activate the baking soda. As does the splash of apple cider vinegar called for in the recipe! Which might sound like a bizarre addition, but is actually a signature ingredient in red velvet recipes. You’ll also need red food coloring! 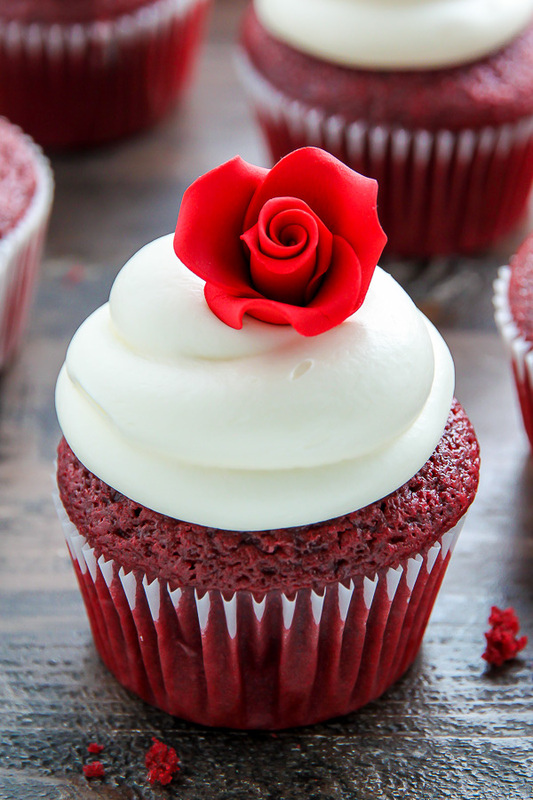 This ingredient gives our delicious cupcakes their trademark red color. You can increase the amount of food coloring for a more dramatic red color or reduce the amount for a more subtle hue. If you do not use food coloring, you may omit it from the recipe without making any additional changes, but the cupcakes will have a rather odd color and definitely won’t be visually identifiable as red velvet. There are some natural food colorings that have come on the market recently, so those could be an option to explore, too. There are also gel food colorings on the market, which can be used. But you may need to adjust the amount of color added. 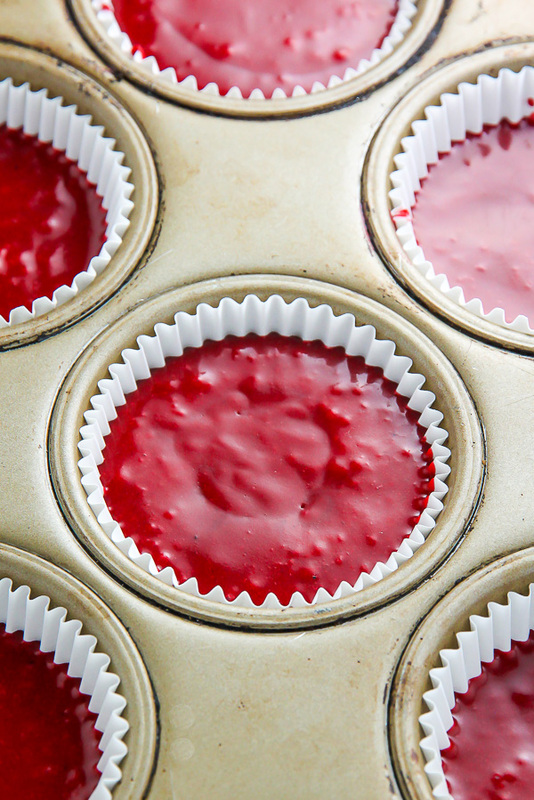 Assembling the batter for these red velvet cupcakes is easy! But there are a few steps! First, you’ll need to melt a 1/2 cup of butter in a large bowl. Then you’ll add in the oil and vanilla. Next in is the sugar, and the the eggs. After all of the wet ingredients have been incorporated you’ll add in the all-purpose flour and other dry ingredients. Before you bake these cupcakes, you’ll need to preheat your oven to 350 degrees. You’ll also need to line a cupcake pan with liners. I suggest spraying the pan lightly with non-stick baking spray to ensure there’s no sticking, but this is up to you! You’ll divide the batter among the prepared molds, filling each line 3/4 of the way full. You’ll have enough batter for about 18 cupcakes. The cupcakes need to bake for about 16 minutes, or until a toothpick inserted in the center comes out clean. Don’t open your oven before the bake time is up, or the cupcakes may sink in the middle. If you’d like to make mini cupcakes using this recipe, you’ll need to adjust the baking time. I find minis bake in about 10 minutes, but this will vary depending on the pan you use. You should get about 2 dozen mini cupcakes, and have plenty of frosting for all of them. If you’d like to make a red velvet layer cake, I suggest using one of these recipes: White Chocolate Red Velvet Truffle Cake or Classic Red Velvet Cake with Cream Cheese Frosting. And if you really want to try a fun red velvet recipe, give these Red Velvet Donuts a try! These cupcakes need to cool completely before frosting. Attempting to frost hot – or even slightly warm – cupcakes will not work. Trust me! Here’s the best way to cool them: when you remove the cupcake pan from the oven, place it on top of a cooling rack. Allow the the cupcakes to cool, in the pan on the rack, for about 20 minutes. After 20 minutes, remove the cupcakes from the pan and place them on the cooling rack to cool completely. I find it takes about 40 minutes for them to be fully cooled and ready for frosting. 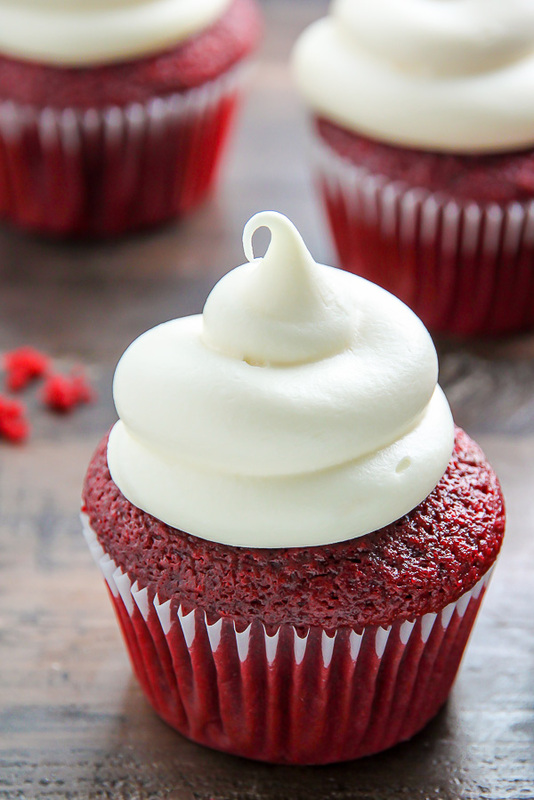 A red velvet cupcake is nothing without a generous swirl of fluffy cream cheese frosting! So I want to teach you exactly how to make the BEST cream cheese frosting. Lucky for us, it’s so easy! And requires just a few basic ingredients: cream cheese, powdered sugar, butter, and vanilla. You’ll place all of them in a large bowl and whip them up until you have a smooth and creamy frosting. The key to making luscious bakery style frosting at home? Soft cream cheese and butter. You’ll want to leave both of these ingredients out on the counter for at least 45 minutes before making your cream cheese frosting. You want the texture to be a little softer than room temperature. If the ingredients are cold, they won’t blend or bond properly. The cream cheese frosting can be made in advance, and stored in the fridge, for up to 3 days. Bring it to room temperature and give it a good stir before use. I do not suggest freezing the frosting. To truly make this a one bowl cupcake recipe, wash out the bowl you used for the cupcake batter and reuse it for the frosting. Please note: you will need an electric mixer to make the frosting, so be sure to have one handy. I love using this Kitchen-Aid hand mixed. But a stand mixer fitted with the paddle attachment will also work. 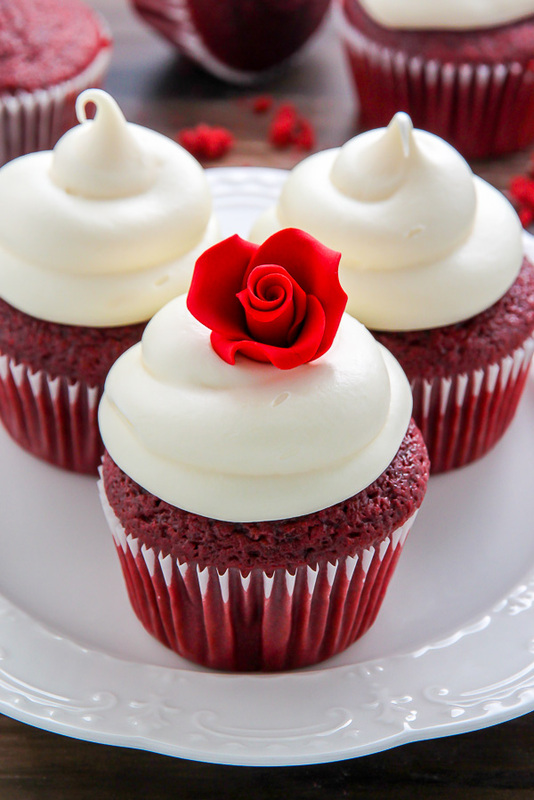 I used these Wilton roses to decorate some of the red velvet cupcakes. Aren’t they so pretty? Another decorating technique I love is to sprinkle extra cake crumbs on top of the cream cheese frosting. A lot of fancy bakeries do this and I can see why – it’s easy and so delicious! If you’d like to use cake crumbs as decoration, simply crumble up one cupcake and sprinkle the crumbs on top of freshly iced cupcakes. It’s important to sprinkle them on while the frosting is freshly piped (or spread), otherwise they won’t stick. I recommend doing this step in a room with hardwood floors. I’m still finding red crumbs in my carpet. I used this round piping tip to pipe the cream cheese frosting onto these cupcakes. But you can use any piping tip you’d like! Or, simple spread the frosting on with a butter knife. They’re going to look amazing – and taste delicious – no matter how you decorate them! If you’d like to bake and freeze these cupcakes for a future event, you’ll be pleased know you totally can! Baked – and fully cooled – these unfrosted red velvet cupcakes freeze well for up to 2 months. When you’re ready to serve, simply thaw them on the counter overnight before frosting. 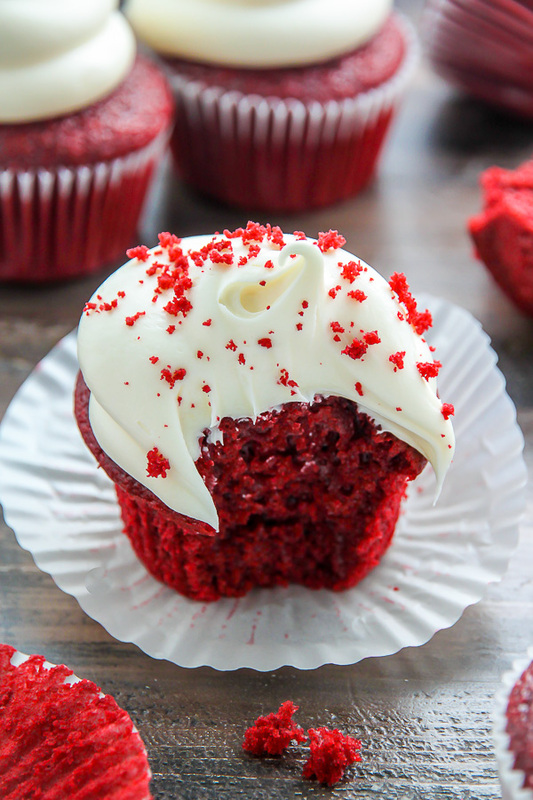 I am SO in love with these fluffy red velvet cupcakes! 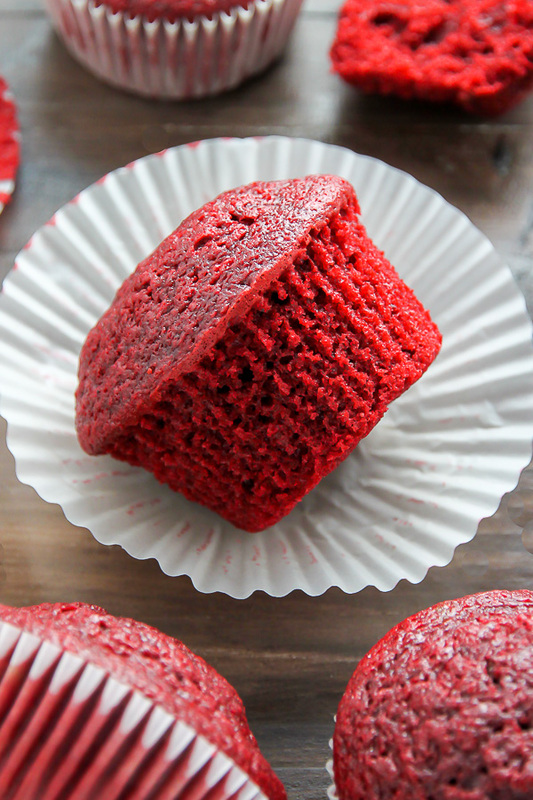 They’re loaded with real red velvet flavor, and don’t just taste like a chocolate cupcake with red food coloring added in. I know you’ll love them, too! If you try this recipe for One Bowl Red Velvet Cupcakes with Cream Cheese Frosting, let me know what you think! Please leave a comment below and don’t forget to snap a pic and tag it #bakerbynature on instagram! Seeing your kitchen creations makes my day. Classic red velvet cupcakes topped with cream cheese frosting! Made in just one bowl, these are easy enough to whip up any day of the week. Preheat the oven to 350 degrees (F). Line a 12-cup cupcake/muffin tin with cupcake liners and lightly spray the liners with non-stick spray, set aside. Place the butter in a large, microwave-safe bowl. Place the bowl in the microwave and melt the butter, heating it in 30 second increments, stirring in between each increment. Add in the oil and vanilla and whisk smooth. Add in the sugar and whisk until well combined. Add in the eggs and egg yolk, one at a time, beating well after each addition. Add the flour, cornstarch, cocoa powder, baking soda, baking powder, and salt to the wet ingredients and lightly combine them with a whisk before beating them into the mixture, stirring until it's just combined - be sure not to over mix here! Whisk in the apple cider vinegar and buttermilk and whisk smooth. Fold in the sour cream. Finally, stir in the food color, whisking the mixture just until combined. Divide the batter among the lined cupcake molds, filling each 3/4 of the way full (you will have enough batter for about 18 cupcakes). Bake for 15-17 minutes, or until a toothpick inserted in the center comes out clean. Cool completely before frosting. In a large bowl using an electric handheld mixer, beat the cream cheese, butter, and vanilla on medium-high speed until completely smooth; about 2 minutes. Reduce the speed to low and gradually add the sifted confectioners' sugar and salt. Once all of the sugar has been added beat on high-speed for 1-2 minutes. Once the cupcakes have completely cooled, spread the frosting over the cupcakes or use a piping bag to pipe it into decorative swirls. Store these cupcakes in the fridge, covered, for up to 3 days. What brand for the color red did you use what it gel? can i use this recipe for an actual birthday cake? Hi Anjie. I’ve never tried making this recipe into a full cake, so I’m unable to say if it would work. If you try it, you’ll definitely need to increase the bake time. These are amazing !!! I made them and they came out wonderful! Thanks for the recipe! I’m a huge red velvet fan. I cannot get over how much I love this site. Your pictures are amazing. I think you truly are very talented. Thank you, Iram! You’re the sweetest. Hi! These look amazing. As someone who bakes, but isn’t particularly well-versed in the dos and don’ts (and only *just* tried my first completely homemade cupcakes recently), I have a couples of Q’s. Hi Rissi. I have to say I am not able to confidently answer either of your questions as I’ve never tried making these cupcakes into a layer cake or substituting the dry ingredients for a baking blend. I would recommend following this recipe exactly for best results. Is it 1 stick = 1/4 cup or 1/2 cup butter? Thanks! One stick is 4 ounces (1/2 cup). Thanks for answering this! I live in South America and here, a stick is not a stick 😉 Came to the comments hoping someone else had asked. It is good to remember not all of your fans live in the USA! Should the sour cream and buttermilk be room temperature as well? Looking forward to making these! Can I us corn oil I wonder ? Sunflower oil, olive oil , vegetable oil ? Can I substitute sour cream with something else? Full-fat Greek yogurt might work! I tried it again today and added coffee to get the red velvet taste and it was AMAZING! ! I made it 2 days in a row it’s just amazing! I noticed that they rise beautifully while baking but then they deflate why is that happening? Hi Korntee. This frosting is very thick by nature, so I’m not sure why yours came out runny. Did you follow the recipe exactly as written? The trick is to beat the butter until it’s extremely pale – almost white. It lends to a perfectly white buttercream (or cream cheese) icing without sacrificing that delish buttery flavor! only 1 cup flour?? i would try but seems too little flour for the amount of other ingredients?? Yes, that is the correct amount of flour. The cornstarch and cocoa powder also add structure to the cupcakes. The red coloring should be liquid,paste,gel…..? I love all your posts!!! Do you use the same recipe for a red velvet cake? Just curious. The cupcakes look awesome. There’s no buttermilk where I live. What can I use instead of it? Thank you! Put a Tablespoon of white vinagear in the measure cup and then add regular milk to the required measurement. Let it sit for a minute or 2 and you’re good to go. 1 cup of buttermilk: 1 Tablespoon white vinegar adding enough whole milk to make 1 cup. 1/2 cup of buttermilk: 1/2 Tablespoon white vinegar adding enough whole milk to make 1/2 cup. I use that substitution quite frequently when making my scratch German Chocolate Cake. I’ve also used cider vinegar or lemon juice instead of white vinegar and heaven forbid, I’ve also used fat free milk. What can I use instead of canola oil? Would a vegetable oil like sunflower oil or corn oil work? Hi Eva. I believe an equal amount of melted coconut oil or vegetable oil would work. I have little experience baking with sunflower oil and corn oil, so I cannot say for those. Good morning! I LOVE LOVE LOVE your blog and cupcakes. I made these along with 4 other red velvet cake recipes to test against each other and these were my favorite!!! They have such a unique flavor. I thought the 2.5 tablespoons of cocoa would result in a more chocolate tasting cupcake, but I was wrong. Question: How do you measure your flour? Do you weigh it and if so, how many grams or ounces? Hi Vanessa! So happy these cupcakes were a winner for you 🙂 I do not weigh my flour; I lightly spoon it into the measuring cup and level it off with the flat end of a knife. I hope that helps! Have you made these cupcakes into mini ones? If so how do you alter the baking time and temperature? I just made these and the taste was amazing but every one of mine sank :(. I didn’t over beat either . Thoughts? Hi Dana. I’m sorry to hear your cupcakes sank! The main reasons cupcakes deflate are: 1) Over-beating the batter. Over-beating allows too much air into the batter. The air collapses when the cupcakes bake, along with the cupcakes or incorrect oven temperature. 2) If your oven temperature is too high, it can cause the cupcake to rise too rapidly. I suggest using an oven thermometer if you don’t already own one. 3) Expired baking powder or baking soda. I hope these tips help! Mine also completely deflated when I took them out of the oven. They are all sunken. Why would that happen? Hi Erin. I’m sorry to hear your cupcakes sank! The main reasons cupcakes deflate are: 1) Over-beating the batter. Over-beating allows too much air into the batter. The air collapses when the cupcakes bake, along with the cupcakes or incorrect oven temperature. 2) If your oven temperature is too high, it can cause the cupcake to rise too rapidly. I suggest using an oven thermometer if you don’t already own one. 3) Expired baking powder or baking soda. I hope these tips help! Thank you! They were most likely over-beaten, as my 4 year old was my baking helper and did all of the mixing :/. Is gel or liquid food coloring better? I only have experience using liquid, so I’m not sure what or if the advantages of gel would be. It takes less gel than liquid! THANK YOU FOR THIS RECIPE! I made these last night and not only was the recipe so easy, but they taste amazing. I absolutely love the consistency of the cupcake, and it has the perfect flavor. My hubby could not stop eating these tasty treats. Definitely going to whip up another batch this weekend, maybe this time I’ll try topping it with oreo crumbs!! This is easily our new favorite recipe 10/10! I just made these! Omg! Delicious! I felt that they could do without a tiny bit more chocolate. Otherwise they were very easy to make and perfect. Thank you for the receipe. SO glad you enjoyed the, Simi! I made these with my 10 year old niece today. They are quite moist, and she loved them, but I found them to be rather bland. I’ve never made red velvet before… Is it supposed to taste plain? Maybe some ground espresso would improve the flavor? The frosting turned out perfect…. We have lots left over too! whenever i add starch my cake truns out really really dense and chewy. can i use more AP flour in place of cornstarch ? Hi Anu. I wouldn’t recommend it. In this recipe the cornstarch makes the cupcakes moist and fluffy. Hi, why do you add an extra egg yolk, what does it do to the batter? Can I just add the 2 eggs? It adds moisture and flavor. For best results I suggest sticking to the recipe as written. Brillant photographs! I love, love so much! Thank you! I hope you get a chance to try them! hi. i want to try this for my son’s birthday, but am allergic to apple cider vinegar. can i use plin vinegr insted? thank you. Hi! I love these cupcakes and have made them many times, however I now need a blue velvet cupcake for a special event. Can I substitute blue coloring for red coloring in this recipe? Thanks! Hi Kelly! While I think blue coloring should work just fine, I can’t say for sure because I haven’t tried in my own kitchen. But I do think the blue should cover any brown from the cocoa powder 🙂 If you try, I’d love to hear how they turn out!!! Hi! I Made these cupcakes and they are delicious! Super moist and fluflly! Have you or anyone tried to make these as a cake? If so, how did it turn out? Can I substitute plain white vinegar instead of apple cider? I’ve tried the recipe but mine deflated after While cooling from a wire rack. Maybe the baking powder and the flour I used isn’t potent/fresh enough (they’ve been resting on the shelf for quite some time now)? That could be the reason? That definitely could be the reason! Especially the baking powder. Other reasons cupcakes sink is over mixing the batter, opening the oven while they bake, and not adding enough flour. I´ve try this recipe several times, and it´s wondeful, my cupcakes always turn out delicious, fluffy, and pretty. The key is follow the recipe to the letter..
Hi I’m going to make these and wanted to know how many grams a stick of butter is please? Made these today and they turned out wonderful! So moist and delicious Thanks for the great recipe! My cupcakes went splat! I filled them 3/4 full they rose over the tins and then went splat. What did I do wrong so I can fix for next time? Hi , i want to ask about the stick of butter , is it 50 grams ? I made these in my bonCOOK muffin tray and they turned out perfect! Thanks for the recipe! If you haven’t tried bonCOOK products you should check it out. Hi , i just baked these wonderful babies , my only concern is they’re not tangy enough , i am not feeling that red velvet punch , i followed the recipe exactly , any idea where i went wrong? hi! i made the batter this morning but had tu run off before getting the cupcakes in the oven. should i wait until the batter is room temp to bake them? Hi Paulina. Because cupcake batter has active ingredients, the batter shouldn’t be made ahead of time. I haven’t tested this method, so unfortunately I cannot advise. But we’d love to know how they turned out!